Recent years have shown an increased interest in the cognitive and neural basis of emotion in psychiatric and neurological disorders. Indeed, various methods of behavioural and neural measurement of emotional processes are continually being developed and refined, which has led to an explosion of research in this area. This Special Issue of Cognitive Neuropsychiatry brings together timely reviews and new empirical papers regarding the cognitive and neural basis of emotional processing in health and disease, written by renowned researchers in the field. Clinical conditions that are addressed include amygdala damage, bipolar disorder, schizophrenia, social phobia, psychopathy and alexithymia. B.A. Strange, R.J. Dolan, Anterior Medial Temporal Lobe in Human Cognition: Memory for Fear and the Unexpected. D. Tranel, G. Gullickson, M. Koch, R. Adolphs, Altered Experience of Emotion Following Bilateral Amygdala Damage. M.L. Phillips, The Neural Basis of Mood Dysregulation in Bipolar Disorder. C.G. Kohler, E.A. Martin, Emotional Processing in Schizophrenia. M. van 't Wout, A. Aleman, R.P.C. Kessels, R.S. Kahn, Object-location Memory in Schizophrenia: Interference of Symbolic Threatening Content. J. van Honk, D.J.L.G. Schutter, Unmasking Feigned Sanity: A Neurobiological Model of Emotion Processing in Primary Psychopathy. E.J. Hermans, J. van Honk, Toward a Framework for Defective Emotion Processing in Social Phobia. B. Bermond, H.C.M. Vorst, P.P. 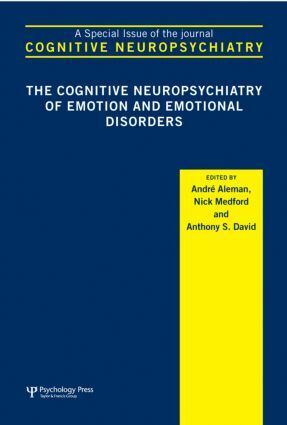 Moormann, The Cognitive Neuropsychology of Alexithymia: Implications for Personality Typology.